It doesn’t seem like much at first glance: The frontman of the wildly popular Korean boyband BTS tweeted a song recommendation to his 14 million followers. The performer, who goes by RM (aka Kim Namjoon), included a screengrab of the song playing from his phone — Troye Sivan’s “Strawberries & Cigarettes” off the Love, Simon soundtrack. “It’s great,” he wrote in Korean. BTS, it’s worth mentioning, were the most tweeted about celebrities in 2017. Love, Simon, of course, is the recent Greg Berlanti-helmed teen rom-com with a gay protagonist, a mainstream first. Add to that the fact that Troye Sivan is a young, openly gay pop star, and this confluence of acceptance was not lost on people. The simple tweet has garnered over 670K likes and 265K comments. “Yasss we need more love and less hate in the world,” another commenter wrote. “‘If u think namjoon sharing a gay song from a gay movie sung by a gay artist isn’t an iconic and political move, ur wrong,” said another. “My gay soul is shaking thank u legend,” added one particularly shook fan. And as it turns out, the love is mutual. 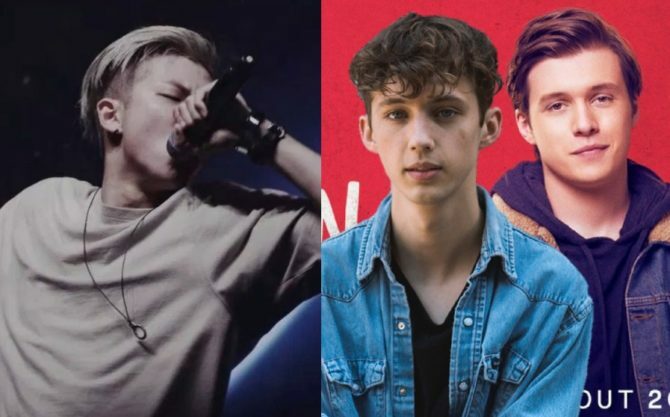 Among K-pop’s stars, open support for gay rights is still uncommon. For BTS to be as vocal as they are is hopefully setting a powerful trend. Smoking is a major problem for LGBT people and leads to lots of senseless painful deaths so it’s not a good song to include smoking. I’m guessing you get invited to all the really good parties. Okay, that song is painfully generic, right down to the trying-too-hard title of it. But, good for Troye.